Your nickname is Monk. Is that because of your approach to training, or something else entirely? When I was younger I used to climb on and over everything so my parents called me a monkey. As I started to grow up they shortened it to Monk. Even in school all my teachers called me monk. All my family and friends still call me monk and it is just one of those nicknames that will stick with me for the rest of my life. We know you’re a criterium specialist. What’s the one race result that’s always been missing from your palmares and why is it so special to you? The one race that I am missing from my palmares is a Criterium National Championship win. This has been one of the biggest goals of mine since I started racing at the age of 10. I have been close a few times and I hope to achieve it in the near future. To stop the drug use in sport. The sport has changed a lot in the last few years with the cycling community making it one of the top priorities to stop the drug use. With all the new tests and the many tests they give each rider a year they are weeding out the drug use in the sport to make it one of the cleanest sports in the world. At the end of the day if everyone is ethical and honest, it eradicates itself. What’s your favourite piece of road in the world that you’ve ridden? The road that leads you to the top of Alpe d’Huez in France is my favourite piece of road to ride on. It is one of the most famous climbs in the world. With all the switch backs, climbing, and amazing scenery it is just a beautiful road to ride on. Personal Hobbies/Interests: Playing Hockey, Hanging out with friends and familly, Playing with my dog George. What would you be doing if you weren’t cycling? Trying to survive in the real world! Favourite Training Ride: Blue ridge Parkway in North Carolina. Favourite Race: Snake Alley Crit. Favourite Music: Rock, Hip-hop, Country. If you could race any cyclist (dead or alive) who would it be and what discipline: Mario Cipollini! In a Crit or a RR. If you could write the first line for your personal Wikipedia page what would it say: Brandon Feehery, AKA: Monk , the sexiest man in cycling! 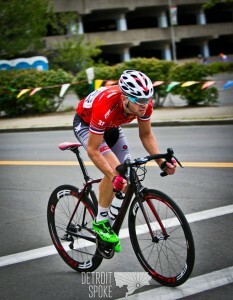 Toughest race you’ve done and why: My first time doing Snake Alley Crit. Pushed myself so hard that I puked all over myself. What cycling accomplishment are you most proud of? Becoming a National Champ!! Any unique pre-race routines or lucky charms? I like lucky charm cereal! Does that count?